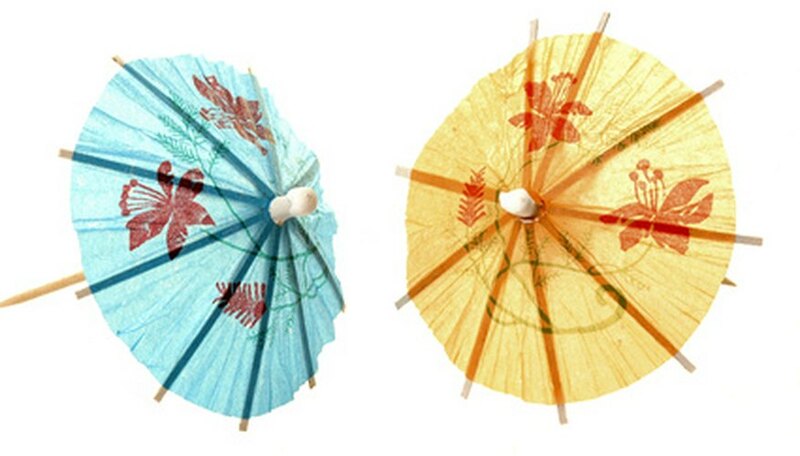 Chinese paper umbrellas make a delightful decoration when crafted in miniature using construction paper and a toothpick. Add them to the top of a drink for a tropical-looking concoction. Cut a four-inch circle out of construction paper. Fold the circle in half, then half again. Repeat this folding until the paper is too stiff to fold in half once more. Unfold. Poke the toothpick through the center of the circle, and then allow the majority of the toothpick to serve as the handle of the umbrella, below the downward-facing cone shape of the umbrella shade. Glue the toothpick in place with hot glue, applying above and below the umbrella shade. Cut a small circle out of thin cardboard to fit into the underside of the cone shade and hold the umbrella open. Poke a hole in the center of the circle with scissors, then insert toothpick into the hole, pushing the circle up toward the top of the umbrella. Glue in place with hot glue, applying around the perimeter of the cardboard circle.